Learn how to deliver change – fast. Download our guide for delivering change fast. Our guide leads you through the confusing world of delivering change, with clear steps for how to enhance each phase of a project. We recognise there are many different methodologies to project management. Our flexible framework takes this into account to fit any business or industry. Discover 22 tips and hints from ChangePro practitioners on how to deliver effective change in your projects, all based on years of experience. 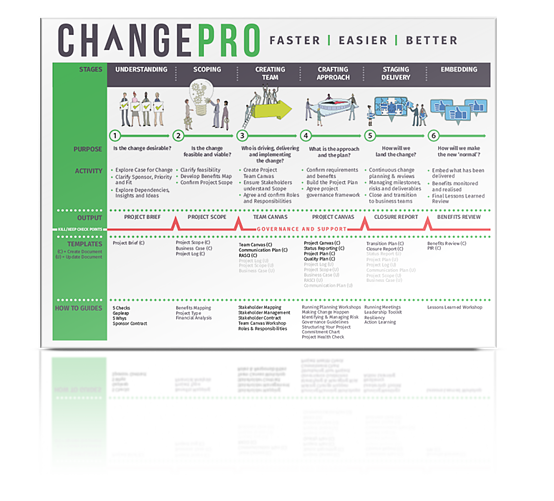 ChangePro aligns to and supports existing project and change methodologies such as Agile, Waterfall, HCD, PRINCE2, Lean, Six Sigma, ADKAR, AIM, and Kotter’s 8 Steps. Our ChangePro framework guides your thinking and helps you select the right approach for your business environment and is supported by mobile accessible videos to enhance learning and application.